Good News For All TNPSC Aspirants. 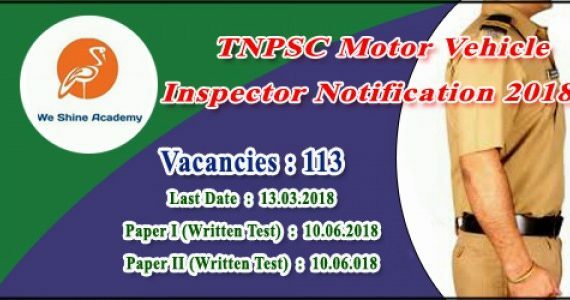 The Tamil Nadu Public Service Commission (TNPSC) is going to announce Motor Vehicle Inspector Grade – II Recruitment Notification 2018. Government ordered to fill 20% of the Vacancies in direct recruitment and 20% on Reservation Vacancies. We are continuously providing latest updates for all the TNPSC Motor Vehicle Inspector Grade II Aspirants.As per the schedule TamilNadu PSC MVI Notification 2018 Will be Live in first week of February 2018. Eligible candidates without any delay can apply. TamilNadu Public Service Commission is the ancient PSC in the Country. Passed SSLC, Diploma in Automobile Engineering/ Mechanical Engineering with relevant experience. Theory of Machines:Balancing of single and multi-cylinder engines, Linear vibration analysis of mechanical systems etc. Mechanics of Solids: Stress-strain relations, uni axial loading, stress/strain tensor applied to a body subject to loads, thermal stress. Beams etc. Engineering Materials:Basic concepts of structure of solids, Crystalline materials, Defects in Crystalline material, Alloys and binary phases diagrams etc. Manufacturing Science: Merchant force analysis, Taylor’s tool life equation, machine ability and machine economics, Rigid small and flexible automation etc. Manufacturing Management:Production planning and control, forecasting-moving average, exponential smoothing, Operation Scheduling, assembly line balancing, product development etc. Thermodynamics:Basic concepts, open and closed systems, Application of thermodynamic laws, gas equations. IC Engines, Fuels and Combustion:Spark Ignition and compression ignition engines. Four stroke and two stoke engines, Mechanical, thermal and volumetric efficiency etc. Heat Transfer, Refrigeration and Air Conditioning:One and two dimensional heat conduction, Heat transfer from extended surfaces, heat transfer by forced and free convection Heat exchangers etc. Turbo Machines and Power Plants: Continuity , momentum and energy equations, adiabatic and isentropic flow, Fanno lines, Rayleigh lines etc. Fundamentals OF Mechanical Engineering:Explanations of different Standards etc. Dynamics: Time study and motion study, Explanations of work, Power, Energy. Conventional Manufacturing Process:Turning, Welding, Shaping, Molding, Foundry Technology, Drilling etc. Thermodynamics: Laws of Thermodynamics, First law, Second law, Zeroeth law, Statement and Explanation etc. Electrical Machines and Electronics:Generating equipments, D.C. Motor, Three phase Induction motor, Single Phase Induction motor, Alternator, Transformer etc. Kinematics and Dynamics of Machine:Simple mechanism, kinematics and their classifications, link mechanism. Inversion etc. Vehicle Dynamics: Understanding of vehicle dynamics, Dynamics load in moving vehicle, Tyres etc. Transmission System:Various drives, Selection of Transmission system. Electrical System and Instrumentations:Battery ignition system and Magneto ignition system, specification of Battery etc. Advance Mechanical Measurements:Tolerances, gauging, Straightness and flatness measurement, surface finish, measurement of pressure, vacuum, angular speed, flow, etc. Automotive System Design:Design of clutch system, Design of propeller shaft, Axle design, Design of braking system etc. Alternate Fuels and Engine:Needs of alternate fuels study and combustion of different alternate fuels like, LPG, CNG, LNG, Alcohol, hydrogen etc. Heat Transfer: Study of Radiator system, Heat transfer by Conduction Convection and Radiation. Study of Different Types of Heat Exchangers.